Far From Home: A brief history of Central American immigration to the U.S. (Global Post) Full Disclosure: I am a graduate of the USC Annenberg School, which contributed to this project. The Hunt for MH370: Courtney Love is all over this story, offering her own analysis of satellite imagery as to the possible location of the plane. Internet hilarity predictably ensues. The Winter of Our Discontent: Looks like the Eastern seaboard is not out of the woods yet. Photographing Chernobyl: Interesting read and amazing photographs of the site of the world’s worst nuclear disaster by Gerd Ludwig, who has made multiple reporting trips there over the past two decades. You can also support Ludwig’s upcoming photo book by donating via his Kickstarter page. The Most Expensive Dog Ever: A Chinese businessman dropped $2 million for a Tibetan Mastiff puppy. Backheel Goal from 35 Yards Out: This is one of the most insane goals I’ve ever seen. The Big Kahuna: This guy may well have pulled off the greatest surfing trick of all time. The New Pravda: Buzzfeed has an excellent look at the propaganda editorial standards and management practices at Russia Today. On a related note, see this Twitter flame war between former U.S. Ambassador to Moscow Michael McFaul and RT staffers over the network’s coverage of the events in Ukraine. Your Next Vacation Spot: I’ve added Navagio to my bucket list based on the photos at this Huffington Post article alone. I still hate myself for the fact that I lived in Italy for four years and never went to Greece in all that time. It Was Twenty Years Ago Today: One of my favorite albums of all time, NIN’s The Downward Spiral, turned 20 last week! They grow up so fast… One more year and TDS will be able to drink legally. Game of Bieber: It turns out the two most insufferable people in popular culture have a lot in common… E! compares Justin Bieber to Joffrey. On a related note [SPOILER ALERT], somebody at Buzzfeed compiled the 14 most brutal deaths on Game of Thrones as animated 8-bit GIFs. Take a wild guess which is number one. I’m not a Yankees fan by any stretch of the imagination, but LIFE Magazine dug up some amazing previously unpublished color photos of Babe Ruth, taken a few months before his death in 1948. Check them out. Update: Worth noting is the fact that today is the 65th anniversary of Babe Ruth’s death, hence the reason LIFE is publishing these photos. Anybody who’s ever been to a Washington Nationals home game is familiar with the race of the presidents that takes place at some point during each game. Nats fans are also familiar with Teddy Roosevelt usually losing the race because of some calamity or other, a situation not unlike Charlie Brown and the football. The last time I went to a Nats game, it was a Sharknado that body blocked the other four presidents, which effectively gave the race to Abe Lincoln. You should be man enough to face your past. We do not remove the Lincoln Memorial because he started the Civil War, rather we leave it as a reminder of the good he’s done. 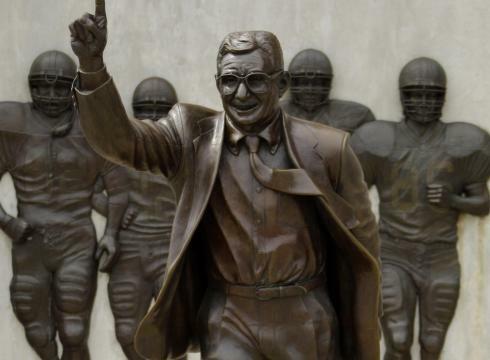 To some, the statute may remind them of the Sandusky Child Molestations, and I understand that. However, how are you to move forward in this life if you do not know where you’ve been? We study history to remind us to not allow it to repeat itself.